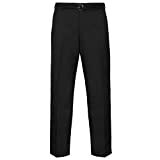 Regular Fitting Trousers In Easy Care Polyester Twill. Trousers Have 2 Belt Loops, A Zip Fly, 2 Side Pockets And 1 Back Pocket. Machine Washable. Comfortable And Discreet Expanding Self Adjusting Waistband. Trousers Have 2 Side Slant Pockets And 1 Back Pocket With A Zip Fly. plain-fronted trouser with a formal crease.